Last Update 24.01.2019 This page in german! "Early on, Dave Edmunds opened the Festival, and after his appearance announced that he didn't want to play live concerts again. But two hours laters, he appeared on- stage again with the Stray Cats, with whom he had produced two albums." Edmunds, who was born in Cardiff on April 15th, 1944, is accepted as THE English pioneer and legend of rock'n'roll, rockabilly and rhythm and blues. He always knew how to keep this style up-to-date. At the age of 15, he already played with the 'Raiders'. He played as front man first with 'Love Sculpture', and later, with 'Rockpile'. Edmunds is famous for his many talents as a singer, guitarist, songwriter and well-loved producer. After his Rockpalast appearance, he has been working mainly as a producer, and returned in 1990 with his own LP. CD - Pile of Rock-Live - order at Amazon ! U 2 will perform as the second group at the Loreley Rockpalast Festival. The name of the group is a play on words meaning: You too. The group, through it's name, shows it's relationship to it's audience on the one hand, and on the other, it's an expression of the practised religion within U 2. All four members are still in their early twenties. Asked for their musical idols, they name bands like The Rolling Stones, The Doors, Jimi Hendrix and The Who. Bono Vox, the singer of U 2, says in this context: "A song like 'Won't get fooled Again' by the Who tells about not giving up. That's the attitude of the best bands. We want our audience to think about what they do. They should realize the pressure they are under, but at the same time, they should never give up." The members of U 2 have known each other since their school days. They just decided at some point to become a group. Demo tapes were sent to different record labels and agents. This resulted in a first LP and small tours through England and Ireland - the group is from Dublin - and some performances at different festivals, amongst others, a very successful opening of the Pink Pop Festival, 1981, in Holland. Today, U2 are considered to have the possibility to become a big name in this business. That became obvious at the Rockpalast Concert in November, 1981, in the 'Metropol' in Berlin. At first, the audience wasn't on the band's side. However, the group played so convincingly, played better by the minute, and projected such irresistable energy, that the spectators couldn't help but to dance and sing along. In 1982 and the beginning of 1983, U 2 mainly spent their time touring through the USA. The audiences and the critics there are equally enthusiastic about this group; Bono Vox is already being declared the upcoming superstar. Success everywhere for U 2 and they will certainly also convince the public in Germany of their skillls at the Loreley Festival! "U2 at the Loreley. Bono's charisma was enormous. He went into the audience and was always right in the middle of all the happenings. He carried a white flag: A symbol of willingness to communicate in a world full of problems, with which U2's lyrics deal with. No instruments were necessary at the end of his appearance. The audience had joined itself with the group: "We will sing a New Song". There's a lot to say about U2 and they have a gung-ho group of regular fans, what you can see nowadays by their gigantic presence in the Internet. It all started in 1976 as a school band in Dublin. 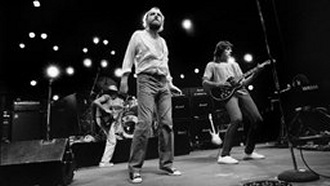 Within years, the band developed into one of the best- loved British rock bands and became a World Act that filled giant stadiums everywhere. Many songs landed in the Top Ten. They invested the profits from their commercial successes into the Windham Hill Studios and their own record label, Mother Records. Their political involvement can be seen in the projects Band Aid, Live Aid, Amnesty International, Artists United Against Apartheid, as well as their foundation Self Aid in Dublin, against unemployment. 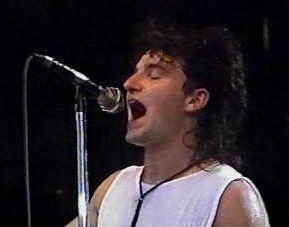 In 1990, the band split up for a while due to their bass player's alcohol problems and a problem with Bono's vocal cords. The 'Fall of the Iron Curtain' and breakdown of the wall in Germany was also a turning point for U2. The LP 'Achtung Baby' was produced in the Hansastudios in Berlin, and new modern influences were worked in. The tour 'Zoo TV', with a staff of 120, was a multimedia spectacle. The hookup to the MTV Era was accomplished. The next LP brought about another turn in their style and U2 also made some music for movies. After ending their mammoth tour 'Zoo TV', U2 took a long break. In 1995, under the project name 'Passengers', U2 released an album they did together with Brian Eno. In the same year, Bono visited Sarajevo. In the following year, he just barely escaped death as his plane was mistaken for a drug dealer's and came under fire while on vacation in Jamaica. On March 3rd, 1997, a new U2 album appeared, 'POP'. It combines the classic U2 sound with the modern sound of the London dance scene. U2 is also involved in the Ireland peace process. 300 Seiten incl. Diskographie, Charts, Plattenkritiken etc. London 1993 Paperback,128 Seiten, ca. 4 Abb. London 1993 Leinen, 320 Seiten, ca. 20 Abb. London 1999, Paperback, 488 S., 10 Abb. München 1993 Paperback,390 Seiten, ca. 20 Abb. CD Songs of Experience (Deluxe Edition) - bei Amazon bestellen! U2 iNNOCENCE + eXPERIENCE Live in Paris [Blu-ray] - bei Amazon bestellen! DVD U2 - 360°: At The Rose Bowl - bei Amazon bestellen! DVD U2 - Go Home - Live from Slane Castle Ireland - bei Amazon bestellen! New York is the home of this group. For approximately four years, they have been known as the Stray Cats and they went to the top, against all trends and expectations. At the end of the '70s, Brian Setzer (then 19), Slim Jim Phantom and Lee (both 17) decided to found a band to realize their own musical preferences. Their outward appearances were kiss-me-quicks and tattoos; a little guitar, drums and contrabass as the instruments. The Stray Cats wanted to play rockabilly for the '80s, but they didn't want to be one of those many revival bands who were satisfied with copying songs and heroes of an over 25-year-old style. Especially Brian Setzer, guitarist, singer and composer of the band, had followed the musical developments of the late '70s. Short songs without long solos, fast and to the point arrangements and lyrics that dealt with the here and now built the substance of the Stray Cats. But even in colorful New York, there weren't many possibilities for a rockabilly band of that kind. They received an offer from London that wasn't quite serious, but the Stray Cats accepted. For three months, there was nothing going on, but finally supported by several performances in important London clubs, and due to the efforts of a female publisher, other musicians, like Dave Edmunds, and the music press in England began to be interested in the three. It was really brave of them to go on- stage with such instruments. Many came to their shows to see whether this was serious music or not. And it worked. Dave produced a first single with the Stray Cats called 'Runaway Boys', a few weeks later it hit #1 in the British charts. Successful tours and festival performances followed. Finally, in 1982, the band's homeland, the USA, also understood that the Stray Cats were something special. There the group is experiencing a repeat of the European enthusiasm. The performance at the Rockpalast Loreley Festival on August 20th will be their first after a break that lasted over a year. The Stray Cats will present their own version of Rockabilly at this festival, too. They never interpreted this style the old way. For them it's just the fun of being on-stage and letting it all hang out. 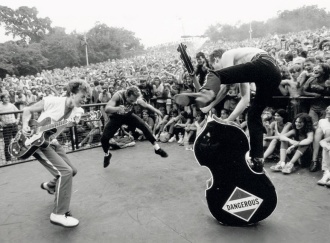 "Rockabilly for the '80s was announced as the Stray Cats got up on stage. Kiss-me- quicks and tattoos are the external trademarks, standing drums and contrabass are the characteristic medium." The band was formed in 1979 in New York by guitarist and singer, Brian Setzer. Dave Edmunds produced their first LP in London, and they soon landed in the charts there. The mixture of traditional rockabilly and new wave helped them on to popularity. Their second LP just trailed along, but an LP with the best songs from the first two Lps helped to be successful in America also. The next Lp was produced from Dave Edmunds again and it went gold. The Stray Cats split up at the end of 1984, but had a reunion in Los Angeles in 1986. Brian Setzer has been very successful as a solo artist and with the Brian Setzer Orchestra. The Stray Cats met from time to time for a concert. DVD Stray Cats Live At Rockpalast 1981+1983 order now at Amazon! DVD - Rumble In Brixton - order now at Amazon! DVD - Brian Setzer - ONE ROCKIN NIGHT LIVE IN MONTREAL - bei Amazon bestellen! To tell the full story of Joe Cocker would fill books. He is a person with many different appearances and many links to rock music. Just one example: The simple man from Sheffield who suddenly has got a world hit with a single and his phenomenal voice. Someone's who's gone through the worst experiences with the business side of this field and who, after 15 years after his first success, finally receives a Grammy for the best vocal performance. Joe Cocker was born in Sheffield in 1944. He busied himself with music after hearing some of Ray Charles' records. After several tries to get lasting recording and tour contracts with different bands, he hit #1 in England with The Grease Band and the single 'With a little help from my Friends' in late 1968. In the following years, Joe Cocker mainly played in the USA. His performance in Woodstock and his 'Mad dogs and Englishmen' tour have become legendary. But Cocker lost his health as well as his musical direction because of the many concerts and because he often changed his manager. Every now and then new records appeared, but most of them were compiled from older songs. Joe Cocker rarely gave performances. At the end of 1980, he accepted an invitation by the Rockpalast to perform in the Metropol in Berlin, a performance nobody has ever forgotten. Cocker showed that he still is an exceptional singer. Having to play four encores, he covered more than his entire repertoire. Within the last two years, he also got new chances concerning his record deal. He signed a contract that allowed him to work with really good musicians again. The result was called 'Sheffield Steel' and was made together with Sly Dunbar and Robbie Shakespeare, among others. Everybody considered it to be the best Joe Cocker album in years. Today Joe Cocker is again touring with a steady band and, as he says, "has a great time singing again". Joe Cocker is going to perform at the Rockpalast-Loreley Festival in the early evening and he will demonstrate why he is, for many people, the white blues singer. You only have to think of his version of 'You are so Beautiful' to realize that he is one of a kind. "Joe Cocker, at this time, is living through a successful phase in a life filled with highs and lows. His album, 'Sheffield Steel', was very well received. But, he was literally pushed through the world: Within four days, he had to manage Los Angeles, the Loreley, Eindhoven in Holland, the Loreley again, and finally, Lund in Sweden. We had the impression that he had been squeezed like a lemon. Joe's concert was fantastic. 'Many rivers to Cross', 'Innercity Blues', 'With a little help from my Friends' - there were many moments where he really got to us. A hint of Woodstock blew over the Loreley." Joe Cocker, his life, his troubles, that's how his story could be called. On May 20, 1944, he was born as the son of a worker in the English steel metropolis, Sheffield. At the age of 16, he played the harmonica and sang in his brother's band. Many other bands followed and in 1968, he landed a giant hit for the first time (GB 1, G3, US 49), with his rendition of the Lennon/McCartney title 'With a little help from my Friends'. This title became 'his hymn' with his appearance at the Woodstock Festival in 1969, and this song can never again fail at a concert. On-stage, Cocker paddled his arms like a windmill and his movements seemed spastic. He sang the blues like a black man from the Delta. The next years could be used as a prime example of how it can be for a rock musician. Cocker was taken advantage of to the limit and made successful tours, but at the end, there were only a few dollars left over for him. The deals were completely out of his hands and alcohol set in. He shuttled back and forth between England and America and toured. In Los Angeles, he collapsed on-stage, drunk. In 1978, there was a three-year time-out for him. In the Bahamas in 1982, he recorded the album 'Sheffield Steel' and rang out his comeback with the schmaltzy song 'Up where we Belong'. The next album, 'Civilized Man', strengthened his success and he finally became a living legend. Sensible management finally blessed him with a decent income, he got married, and lives in Santa Barbara in California. He was there for the 25th Woodstock Anniversary spectacle and received an Honorary Doctor title in his hometown of Sheffield. Have A Little Faith                       (????) PMI 724349135239 72min. Joe Cocker DVD - Live in Berlin - order at Amazon ! Joe Cocker DVD - Live at Montreux 1987 - order at Amazon! The Steve Miller Band concert will end the Rockpalast-Loreley Festival. Steve Miller is one of the few rock musicians of the first generation who still makes interesting music, tries out new things and gives new impulses to rock'n'roll. Steve Miller was born in 1943. He and his parents were friends of T-Bone Walker; through this connection, Miller was almost forced to discover rhythm and blues and the electric guitar. First bands were founded in school. They sounded so good that Miller decided to become a professional. From 1966 on, he played at all well-known places on the American west coast and he was one of the few who didn't say yes to the first offer a record label sent them. He demanded several things and was one of the first to achieve better working conditions for rock musicians, which are standard today. This included the total control over the content of his records as well as the possibility to choose studio and producer himself and a rather big advance for the financing of his productions. Between 1968 and 1972, the Steve Miller Band published different records which established their reputation as one of the most advanced and influential groups. At that time, the term 'progressive' was still being used. Miller impressed with his perfect arrangements, and songs that mirrored his varied influences (from rhythm and blues to country to folksongs) and the full use of the studio's possibilities. The Steve Miller Band live concerts were always musical highlights. Miller himself once made this comment: "There was already a difference when we performed in San Francisco in 1967. All the bands that are very famous today, back then still used to play hours-long jam sessions about Johnny B. Good etc., but they couldn't really master their instruments because they had just begun to learn. We already had the experience of some years of touring as a band for people like Muddy Waters, for example. No one could tell us what to do." In the 1970s, Miller took long breaks, partly due to illness. But each time he came back, it was with a big bang. In 1973, it was 'The Jocker', in 1976 'Fly like an Eagle', with 'Rockin' Me' and other hit singles. Nowadays, Miller is very relaxed and only does things that are fun for him. In recent years, he was in Europe again for the first time after many years and gave concerts which lasted over two hours, encompassing his whole repertoire, from 'Livin' in the USA' to 'Abracadabra'. On-stage, the Steve Miller Band is simply one of the best. Miller himself is an experienced guitar player who knows that the quality and the tension of a solo often depend on which notes are left out. Alongside of him is Norton Buffalo, who can do unbelievable things with his harmonica. The Steve Miller Band concert at the Rockpalast-Loreley Festival will offer rock'n'roll at it's best, with everything that goes with it. "American show biz and Las Vegas at the Loreley. Stever Miller had decided to give his only concert in Europe in 1983 at the Loreley: "That's got to be a spectacular event! ", was his evaluation. He wanted to turn into a tiger with 'Abracadabra'. Two tigers with a trainer appeared at the Loreley. The tiger cage found no favor with the Stagemaster, Thilo Schernau. A newer, safer cage had to be built. It had to be worked on day and night. In London, a complete stage set had to be designed, just for this concert. On top of that, a magician came from America. All of this - and don't forget, a computer - saw to it that some of the team members got very little sleep during the production week." Steve Miller was born in Milwaukee on October 5th, 1943, but grew up in Texas. 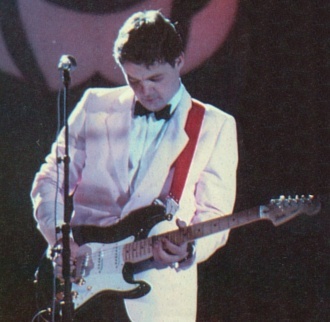 He began playing early with a guitar and during his high school days, played in bands. He received a doctorate in the subject, 'Comparing Literature', but decided in favor of music in 1965. He lived through the music stream in the USA, then onto the blues in Chicago, then the Flower Power times in San Francisco. In 1972, he was forced to take a break after an accident. Afterwards, he started with a new concept that turned him into a megastar. The platinum LP 'Fly like an Eagle', made him famous with three Top 20 single releases. CD - Live! - order at Amazon ! Steve Miller - Live from Chicago (2 DVDs + Audio-CD) - order at Amazon !